Check out these new wooden displays perfect for showcasing several pieces. If you are a trade or craft show regular, you know the dilemma of wanting to pack light but needing a variety of displays for your items. Thank goodness for ones that are not only able to hold a lot of pieces, but are also aesthetically pleasing. If you’re looking for this type of displays for a spring fair or a craft show, you’re in luck. Today, we will feature four new ones from our collection. 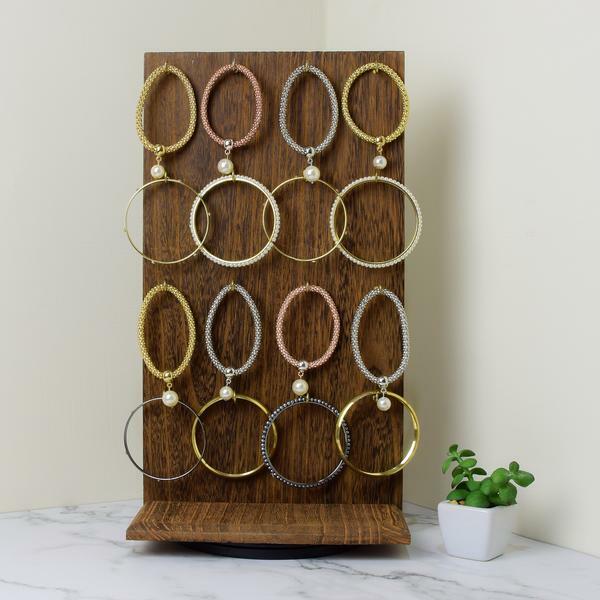 Let’s start with a jewelry display for earrings. 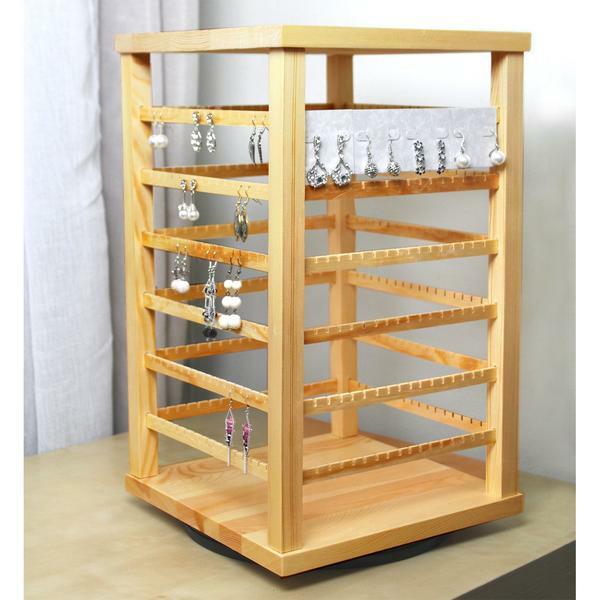 This display with a natural solid wood finish is perfect if you have many pairs to sell. It features six bars on all four sides, and each of this bar can hold eight pairs, making it a total of 192 pairs! It also boasts a rotating feature, making it easy for customers to check out all the designs. 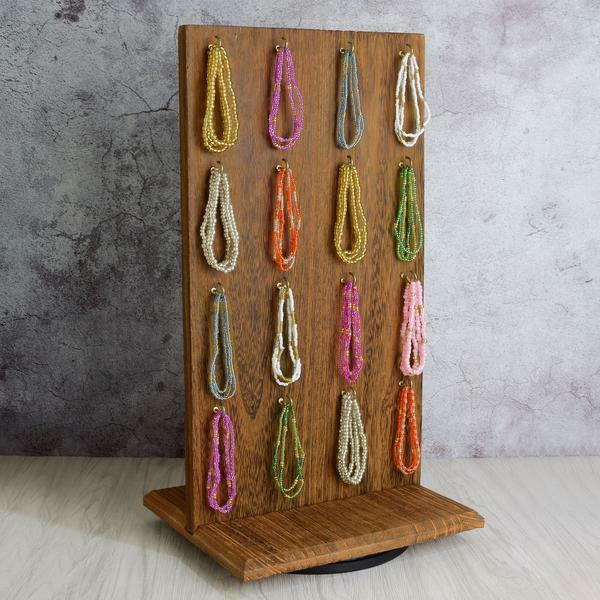 This display has an overall dimension of 10 1/8"W X 10 1/8"D X 17"H.
As for necklaces, this wooden necklace display is a good choice. It can hold up to nine necklaces of varying lengths. Aside from looking rustically beautiful, this display also features a plank-style design making it easy to assemble and disassemble. There are also two height pegs at the back of the board, allowing you to choose the height of the display. It has an overall size dimension of 9 3/8"W x 5 1/2"D x 10 1/4"H.
Next up is this wooden display. It can hold multiple bracelets, up to 32 pieces as each side has 16 hooks. What’s best about it is that it has a rotating base, making it easy for customers to check out all the bracelets. 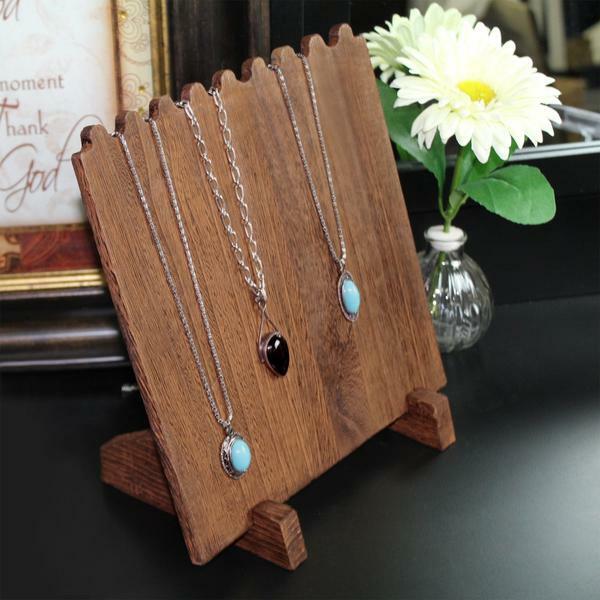 As with the necklace display, this one also has a plank-style design for portability and easy assembly. 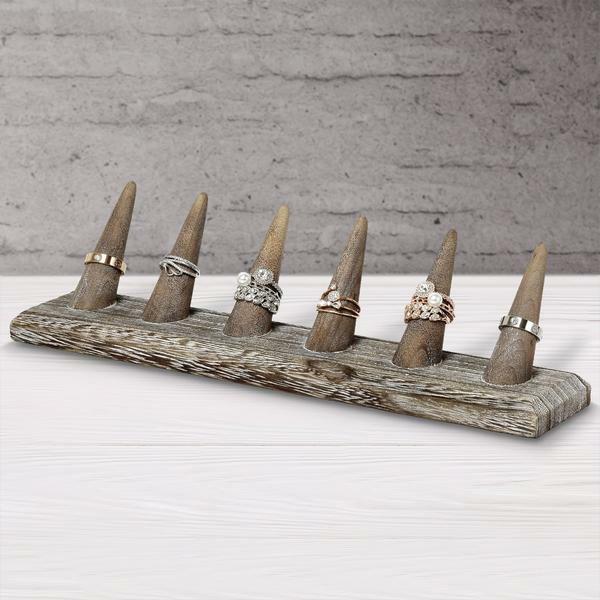 Its overall size dimension is 9"W x 7 1/2"D x 16 1/2"H.
Last is this chic wooden ring display. This particular piece can hold about 18 rings or more, depending on the widths of the bands. It features six holders atop a beveled rectangular base. Even if it’s made of wood, this display’s lightweight and durable. It’s also available in three other wooden colors. This ring display’s overall dimension is 11"W x 2 3/8"D x 2 3/4"H.
Which of these is your favorite? Let us know in the comments below!